Don't forget that abstracts for Origins 2017, to be held at San Diego Christian College on July 20-22, are due on May 5. That's one week from tomorrow. Get all the details at the Creation Biology Society website. Now if you'll excuse me, I need to go back to scouring the internet for more information on pronghorns... I bet you can guess why. I had a great time at our annual Science Day at Rhea County Academy last Friday. For the third year in a row, I helped judge all the science fair projects, and I was impressed this time with how much the projects have improved. Every student attempted some kind of experimental project, and the experimental design was much better this year. This improvement was most noticeable in the ninth grade. I listened carefully as one student explained how her sample size wasn't quite big enough to calculate statistical significance, and I got into a great conversation with another student about his experimental design. These students were thinking very carefully about replicates, sources of error, bias, controls, and everything else that makes a good experiment. I'm accustomed to asking these sorts of questions to get students thinking, but these students were way ahead of me. It was remarkable. Will the real date of Homo naledi please stand up? Most of my readers know that I'm kind of excited by Homo naledi (or is it dangerously obsessed? It's hard to tell sometimes.) I've been eagerly awaiting news of the date and lead researcher Lee Berger's next discovery since news of H. naledi broke nearly twenty months ago. To review, H. naledi was discovered in a nearly inaccessible cave chamber in the Rising Star cave system north of Johannesburg, South Africa. The site is literally around the corner from two other important fossil hominin locations, Swartkrans and Sterkfontein, so the fact that something this amazing had been sitting under our noses all this time is kind of delightful. What else might be lurking right around the corner? It's been a busy month. Most of my time has been consumed with production on biology lessons for Schoolhouseteachers.com, and that's meant too many 13-hour days trying to get everything done. The good news is that I've reached the end of that work. I'll be putting the finishing touches on our final biology lessons this week! Through that outreach, Core Academy reaches 6,000 families! So it's definitely worth the long hours. 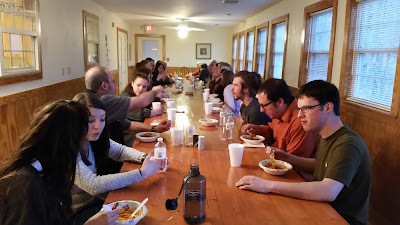 We also had our third Smoky Mountain Creation Retreat, and it was the biggest one yet. We sold out for the first time ever, and we had nine students this year. As usual, everyone stayed up way too late talking, which is kind of the point. On Saturday, a bunch of folks went off hiking, while the rest of us just relaxed. It was a great weekend! I definitely want to thank all the donors to Core Academy who make this retreat possible every year.